One major thing that Lee and his government never allowed is religious intolerance as well as racial disharmony. They were in a serious problem and they needed no unnecessary rancor, either tribal, ethnic or religious to come and distract the solution they are trying to develop for the problems of Singapore. To this length, laws were in place to check religious and racial excesses. Singapore at this time was vulnerable to attacks and threats from the communists and even Indonesia. Since Singapore was now part of the United Nations, Lee appointed Goh Keng Swee as the Minister for Interior and Defence. This was done to build up the Singapore Armed Forces (SAF), while seeking support from countries like Israel and Taiwan for training, advice and facilities. Lee made a decree in 1967 that all able-bodied male Singaporeans that are age 18 and above must serve National Service (NS) in the Singapore Armed Forces, Singapore Civil Defence Force or the Singapore Police Force. As at 1971, Singapore had 16,000 men in 17 national service battalions and 11,000 men in 14 battalions as reserves. Lee then convinced the Premier of Taiwan to allow the Singaporean troops to train in Taiwan under a codename ‘Exercise Starlight’. One of the urgent and most important tasks required of Lee was to provide stable jobs for the Singaporean citizens due to high unemployment rate. Though tourism solved a part of this problem, but it was not enough to eliminate it. With the support of his economic aide, Hon Sui Sen, Lee established factories and focused mainly on the manufacturing industry. When the British were about to withdraw fully from Singapore in 1971, Lee begged them not to destroy the dock and Lee later converted the British naval dockyard for a civilian use. Lee and his cabinet have done a lot of trial and error over the years, and later came to the conclusion that the only way to boost Singapore’s economy was to bring in or attract foreign investments from the multinational corporations (MNCs). To go about this, they decided to establish First World infrastructure with very high standards in Singapore, this would be able to woo the Americans, European and Japanese entrepreneurs, and professionals to set their base up in Singapore. Not long, in the 1970s, Texas Instruments, General Electric and Hewlett-Packard had laid the foundation and were able to turn Singapore to a major electronics exporter by the 1980s. Singaporean citizens and workers were retrained to get used to the work systems and the cultures of the multinational companies. The government of Lee as well started new industries including steel mills named ‘National Iron and Steel Mills’, the service industries like the Neptune Orient Lines and the Singapore Airlines. Lee with his government also wanted to make Singapore an international financial centre. They invited foreign bankers and guaranteed them the social conditions, skilled professionals, first class infrastructure and also vowed to them that the Singapore government would be interested in sound macroeconomic policies to guarantee a stable Singapore dollar necessary for their survival. While in office, Lee focused mostly on the economy and painted Singapore as a garden city and they have built on such foundation till today. Singapore also faced political corruption. To curb this, Lee made a legislation giving a freehand to Corrupt Practices Investigation Bureau (CPIB) to arrest, search, call witnesses and investigate bank accounts, income and tax returns of people suspected as well as their families. In the light of this, Lee made sure ministers were well paid so they won’t steal. This was ensured to make the government honest and clean. When Lee received as allegation of corruption against Teh Chean Wan, the Minister for National development on 21 November 1986, Lee authorized the CPIB to fully investigate him but even before the charges were pressed, Teh had committed suicide. In 1994, Lee then proposed that the salaries of judges, ministers and civil servants be juxtaposed to that of the top professionals in the private sector so people would be interested in the public sector. In the 1960s, the population of Singapore was growing rapidly and thinking of the effect on the economy, Lee campaigned a ‘Stop at Two’ family program. After a couple had their second child, they have to undergo sterilization. To make this work effectively, lower priorities were given to third and fourth children in terms of education and such families received lower grants. While the number of unmarried graduate women in Singapore was rising, Lee in 1983 made the ‘Great Marriage Debate’ campaign where he encouraged men to marry the highly educated women. Social Development Unit (SDU), a match-making agency was set up in order to facilitate this. In the late 1990s, the birth rate in Singapore was so low that Goh Chok Tong, Lee’s successor gave incentives to married women who could have extra babies and termed it ‘baby bonus scheme’. One of Lee’s beliefs is the use of corporal punishment like caning as a punishment for civil crimes. Lee recounted his days in Raffles institution when he was seriously caned for perpetual lateness by the headmaster, D. W. McLeod. Lee explained, ‘I was made to bend over a chair and was given very good three strokes with my trousers on. He never spared me with those strokes. What actually baffles me is the opposition of the western world to corporal punishment like this. It had no negative effect or any harm on my friends or me’. Lee’s term copied this trend from the British rule and maximized it. Personal violence only brought this type of corporal punishment during military rule, while under Lee, it was used as a deterrent for many crimes. It became compulsory for 42 offences and voluntary for another 42 by 1993. Those that were caned as ordered by the courts include illegal immigrants and drug addicts. As at 1987, there were 602 canings and it rose to 3,244 in 1993 and in 2007 became 6,404. Judicial caning became rampant in 1994 all over the world and an American Michael Fay was even caned for vandalism. This corporal punishment was now official in schools (only for male students) for disobedient students and Lee also made sure it became an official punishment for indiscipline in the military. Since Singapore is landlocked, they had no access to water and had depended on water from Malaysia. This was a disadvantage to Singapore as they faced so many threats of supply cutoff from Malaysia while also using it as a bargaining chip against Singapore. Singapore under Lee then experimented with water recycling in 1974 to end this malady. Due to the high cost, the water treatment was shut down in 1975. The Ministry of Environment and Water Resources (MEWR) then started the Singapore Water Reclamation Study (NEWater Study). They tried to increase the supply of water for non-potable use so that the demand for potable water for non-potable use would reduce. This method worked and in 2008, Singapore started the Singapore International Water Week; this focuses on making water sustainable in cities. Due to the success of this program, Lee was awarded the Lee Yuan Kew Water Prize as the program solved global crisis as a result of low and potable water supply. The prize later became an international award to outstanding groups and individuals. 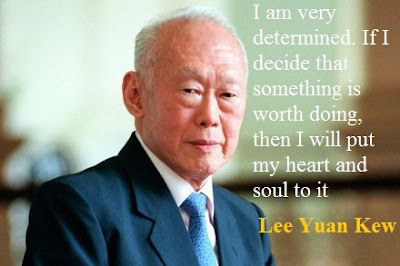 The Malaysian former deputy minister wrote on Lee after his demise, ‘Him and I could not agree on a lot of things. His leaving this world has signaled the end of a people that fought for independence for their countries and know the values of that independence. The pass away of President Suharto and Lee Yuan Kew is a loss of strong leadership for the ASEAN’. After helping the PAP to seven consecutive election victories, on 28 November 1990, Lee Yuan Kew stepped down as the Prime Minister of Singapore and handed over to Goh Chok Tong. As at the time Lee stepped down, he was the world’s longest-serving prime minister and this was the first transition since Singapore gained independence. Lee was not allowed to leave the cabinet after handover and he served as a senior minister in an advisory role. When in public, Lee would call Goh ‘my Prime Minister’, and this doesn’t go well with Goh (Humility would not only take you far in life, it would make you remain at the top).